As a result of the delivery of its third ship, the Disney Dream, from Meyer Werft in January 2011, Disney will be expanding its horizons to include new destinations. It has cruised from California and from Europe in the past, but now will also be extending into the Alaska trade from Vancouver. The line held an open house for a number of guests on board its Disney Magic in Dover last Friday. So where from here? 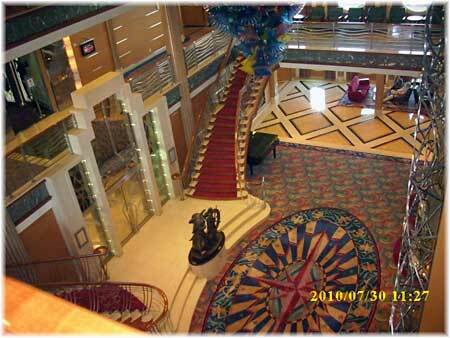 We will have a look at Disney Cruise Line from an adult's point of view. Most people have never heard of the Magical Cruise Co Ltd of Burbank, California, London, but in fact it is this company that operates the Disney Magic and Disney Wonder from its base in Florida. The company, trading as Disney Cruise Line, invited a large number of guests to view its 83,000-ton Disney Magic on its last call at Dover for the 2010 season last Friday. The first impression one gets when boarding is a very high quality finish and public spaces that show great attention to detail. Although the hands that indicate what deck the lift or elevator is at include a little white glove a la Mickey Mouse, this is tastefully done, as in fact are all the children's areas as well. Small maritime touches such as the use of brass, white ropes to hold back shower curtains and windows (and even the shape of verandas) that give the appearance of the promenade deck of an old ocean liner. This is not to mention the ship's very fine lines, and the black hull and two red and black funnel colours that echo those of North Atlantic liners such as the Queen Elizabeth, Queen Mary and Normandie. The feeling in the public areas on board is also quite different from the normal cruise ship, in that the finish shows high quality and attention to detail and the ship tends to exude an air of theatricality about it. Disney also operates its own cruise terminal at Port Canaveral, Florida, not far from Disney World at Orlando, and its own Bahamian private island called Castaway Cay. The company likes to control as much of its own operation as it can and has done so since introducing the Disney Magic in 1998 and the Disney Fantasy a year later. 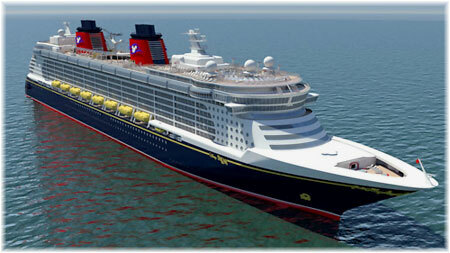 When the Disney Dream is delivered the Disney Wonder will transfer to the west coast. Again, the suites run up to $7,929 per person to Alaska, the Caribbean and Mexico and up to $11,199 each in the Mediterranean. 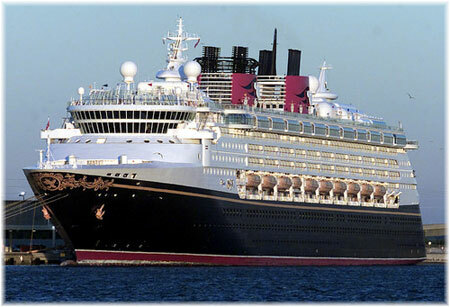 Disney Magic itineraries in 2011 will offer Mediterranean cruises from Barcelona that include either Nice, La Spezia, Naples and Palma or Cannes, La Spezia, Civitavecchia, Naples and Palma (7 nights) and Malta, Tunis, Naples, Civitavecchia, La Spezia, Ajaccio and Nice (10 and 11 nights). Caribbean cruises from Port Canaveral will go either east to St Maarten, St Thomas and Castaway Cay or west to Key West, Grand Cayman, Cozumel and Castaway Cay. The new Disney Dream will meanwhile take over the line's stock 3, 4 and 5-night Bahamas cruises that are usually combined with a stay at Disney World. Disney Wonder's Alaska cruises from Vancouver will include Tracy Arm, Skagway, Juneau and Ketchikan while Mexican Riviera cruises from Los Angeles will go to Puerto Vallarta, Mazatlan and Cabo San Lucas. Other voyages will be offered in positioning season, for example, both Trans-Panama (to position the Disney Wonder to Los Angeles) and Trans-Atlantic, as well as 6 nights Los Angeles to Vancouver and 5 nights Vancouver to Los Angeles b Disney Wonder before and after the Alaska season. Can Adult Couples Cruise with Disney? Two things are of interest for adults on these ships. First, much of the forward part of the ship is dedicated to adults only (only those of age 18 and above are allowed) and overlooking the stern there is the Palo adults only alternative dining room. There is also a large spa area where adults may relax and this includes couples areas and the Cove Cafe is an adults only coffee bar. The adult only areas are decorated in a stylish manner and show no real evidence of being on a ship that was designed for families and children, so it may be possible for an adult couple to cruise on a Disney ship comfortably and without being overly influenced by all the children's activities, which are kept to their own areas and divided largely by age group, while also allowing a family of children of different ages to play together. The large cinema is also rather grand and does show films other then Disney. And even the Disney character appearances are scheduled and announced to that adult can steer clear of them if they wish. 1. When booking your stateroom, choose one well away from the children's areas. 2. Ask for late dinner sitting as most younger children will be on the first sitting. 3. Take advantage of the adults only Palo as much as you can. 4. Use the adults only pool on Deck 9, with its own bar and coffee lounge. 5. Rekax with a couples treatment in the spa. It is worth remembering that Disney also welcomes adults so much thought has gone into the ships' layout for this category of passenger too. 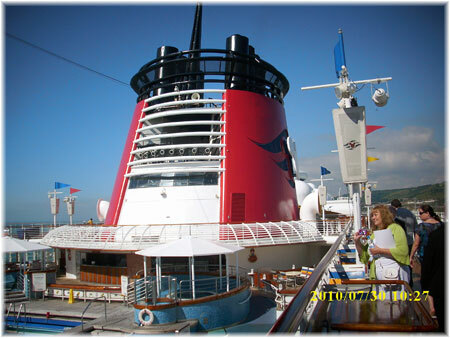 One way forf adults to try a Disney ship might be on the 5-night positioning cruise from Vancouver to Los Angeles on September 20, 2011, with calls at Victoria BC and Ensenada, Mexico.